The genus Mycobacterium includes host-adapted organisms regarded as obligate and opportunistic pathogens and environmental organisms. Factors contributing to this wide range of adaptations are poorly known. We studied the salt tolerance of 46 Mycobacterium species of medical interest. Representative strains of the Mycobacterium tuberculosis complex, Mycobacterium avium complex, Mycobacterium chelonae-abscessus complex, Mycobacterium ulcerans, Mycobacterium marinum, Mycobacterium lentiflavum, Mycobacterium fortuitum and Mycobacterium conceptionense were inoculated on Middlebrook 7H10 medium supplemented with 0–10 % sodium chloride. Colonies were counted after 2–4 week incubation at the appropriate 30–37 °C temperature depending on the tested strain. Further comparative genomics was done on 15 Mycobacterium strains representing the spectrum of salt-tolerance of mycobacteria. Based on the results the different species were grouped according to their salt tolerance into a “salt-sensitive” group (growth up to ≤3 % salt) containing the M. tuberculosis complex, Mycobacterium chelonae, Mycobacterium lentiflavum, Mycobacterium ulcerans and Mycobacterium marinum; a “salt-intermediate” group (growth between 4 and 6 % salt) comprising Mycobacterium avium, Mycobacterium intracellulare, Mycobacterium chimaera and a “salt-resistant” group (growth up to >6 %) comprising Mycobacterium homonissuis, Mycobacterium bolettii, Mycobacterium fortuitum and Mycobacterium conceptionense. Genomic analysis revealed that 290 genes were unique to species belonging to the salt-sensitive group; and that 15 % were annotated as being functionally associated with the ESX secretion systems Pro-Glu and Pro–Pro-Glu family proteins. In this work we found an inverse correlation between salt tolerance and host adaptation. We thus propose that salinity is one of the multiple factors determining the ecological niches of mycobacteria. The genus Mycobacterium comprises more than 150 species . The vast majority of these mycobacteria are environmental organisms found in soil and aquatic environments, with a few exhibiting some degree of host-adaptation, illustrated by their intra-amoebal survival  and variable pathogenicity in mammals and humans, culminating in well-adapted Mycobacterium leprae responsible for animal and human leprosy [3, 4] and Mycobacterium tuberculosis, complex organisms responsible for animal and human tuberculosis . Later organisms exhibit the widest spectrum of niches from soil [6, 7], to amoeba  and mammals including humans . The factors contributing to the survival of mycobacteria in one particular ecological niche are not yet fully understood. Here, we explored salinity as one of the factors which could potentially affect the survival of mycobacteria in their ecological niches. More precisely, we focused our study on a few species of veterinary and medical interest, as they exhibit the broadest spectrum of ecological styles, from inanimate environments to amoeba and hosts. A total of 46 Mycobacterium spp. strains were used in this study. They included 17 M. tuberculosis complex (MTC) isolates, including M. tuberculosis H37Rv CIP104475T reference strain, 12 M. tuberculosis clinical isolates including two Beijing lineage isolates, Mycobacterium bovis Bacillus Calmette and Guérin (BCG), “Mycobacterium canettii” CIP 1400159 and two “M. canettii” clinical isolates (kindly provided by Prof. Eric Garnotel, Hôpital Laveran, Marseille, France); nine Mycobacterium avium complex (MAC) clinical isolates, including three M. avium clinical isolates, two M. avium subsp. hominissuis (here referred as M. hominissuis) clinical isolates, three Mycobacterium intracellulare clinical isolates and one Mycobacterium chimaera isolate; 11 Mycobacterium chelonae-abscessus complex clinical isolates, including three M. chelonae isolates, four M. abscessus isolates, three Mycobacterium boletti isolates and one Mycobacterium massilliense isolate; two M. ulcerans (ATCC19423 and ATCC33728); one M. marinum, three Mycobacterium lentiflavum, two Mycobacterium fortuitum and one Mycobacterium conceptionense clinical isolates. All clinical isolates were identified by 16S rRNA and rpoB gene PCR-sequencing as previously described . M. tuberculosis, “M. canettii” and M. ulcerans strains were handled in a biosafety class 3 laboratory, while other mycobacteria were handled in a biosafety class 2 laboratory. Except for “M. canettii”, all clinical strains have been isolated and cultured by the authors. No ethical approval was required for this study. All mycobacteria were subcultured on Löwenstein-Jensen medium; (bioMérieux, Craponne, France), suspended in sterile phosphate buffered saline (PBS) and vortexed to complete homogenization of the suspension. As for clumping M. tuberculosis, M. bovis BCG, M. abscessus and M. ulcerans, homogenization was achieved by rigorously vortexing with 3-mm glass beads (Sigma-Aldrich, Saint-Quentin-Fallavier, France) followed by four bypasses through a 25-G needle to disperse the remaining clumped bacilli. Homogenized suspensions were calibrated using spectrophotometry to a 1 Mc Farland (McF) unit, equivalent to a 107 colony-forming units (CFU)/mL inoculum for non-clumping mycobacteria and a 106 CFU/mL inoculum for clumping mycobacteria. Middlebrook 7H10 medium (Becton–Dickinson, Le Pont-de-Claix, France) was supplemented with sodium chloride (NaCl) (Sigma-Aldrich, Saint-Quentin-Fallavier, France) in 1 % increasing salt concentrations from 0 (weight/volume) to 10 %. A 100 µL-volume containing 104 CFUs was inoculated in triplicate on 90-mm sterile plates containing Middlebrook 7H10 medium (control) or Middlebrook 7H10-NaCl-supplemented media. Plates inoculated with M. tuberculosis, “M. canettii”, M. bovis BCG, M. avium, M. hominissuis, M. intracellulare and M. chimaera were incubated at 37 °C in a 5 %-CO2 atmosphere. 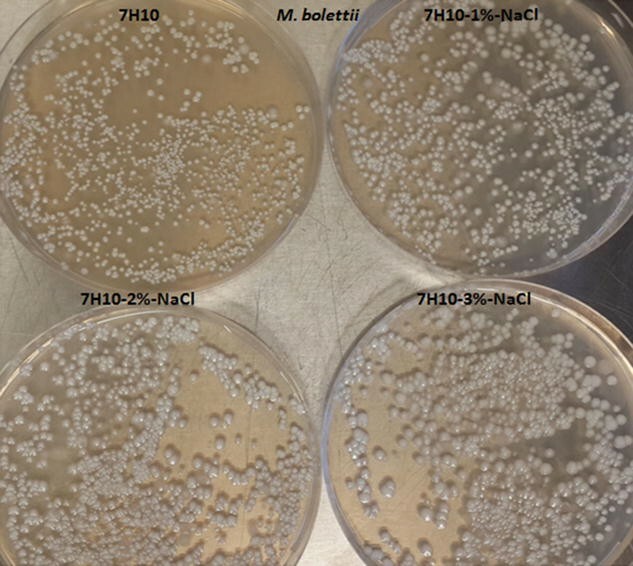 Plates inoculated with M. abscessus, M. chelonae, M. boletti, M. massiliense, M. fortuitum, M. conceptionense and M. lentiflavum were incubated at 35 °C in ambient air as previously described . Plates inoculated with M. ulcerans and M. marinum were incubated at 30 °C in ambient air. Plates were checked by visual inspection weekly for colonies for 4 weeks. Colonies were counted regardless of their size and counting was considered interpretable when >103 colonies were observable on the control (0 %-NaCl) Middlebrook 7H10 medium plates. A strain was considered salt tolerant when more than 50 colonies developed on the 7H10-NaCl supplemented media. Image J program  was used to measure the average size of colonies after 50 colonies were randomly chosen from each plate. The morphology of colonies was observed by the naked-eye. Ziehl-Neelsen staining was conducted to confirm the identity of the colonies. The whole genome and proteome of 15 mycobacterial species under investigation were downloaded from Genbank (Table 1). The proteins were clustered into orthologous groups using orthoMCL  with a conservative parameter value of 60 % sequence identity. Homologous sequences were selected using the all-against-all BlastP algorithm  with an E value of <10−5. Clustering of the orthologous sequences was then analyzed using the Markov Cluster algorithm . Determination of the different unique core genomes was based on the homology clusters found by orthoMCL. The resulting orthologous groups were used to construct a whole-genome tree using the Neighbor-Net algorithm based on a gene content matrix using splitree . The similarity between two species was defined as the number of genes in common divided by the total number of genes of the two species . In the MTC, two M. tuberculosis clinical isolates grew up to 1 % only whereas 10 other M. tuberculosis clinical strains including two Beijing strains and M. tuberculosis H37Rv reference strain grew up to 3 %. M. bovis BCG grew up to 2 % and three “M. canettii” isolates grew up to 3 %. In the M. avium complex, M. chimaera grew up to 4 %, M. avium and M. intracellulare up to 5 % and two M. hominissuis isolates up to 7 %. In the M. chelonae-abscessus complex, M. chelonae grew up to 3 %, M. massiliense up to 4 %, M. abscessus and M. bolettii up to 7 %. Then, M. marinum and two M. ulcerans reference strains grew up to 3 %. Further, M. lentiflavum grew up to 1 %, M. conceptionense grew up to 7 % and M. fortuitum grew up to 8 % (Tables 2, 3). Based on these results, we defined three groups of mycobacteria: Group 1 includes “salt-sensitive” species (growth up to ≤3 % salt); Group 2 includes the “salt-intermediate” species (growth up between to 4 and 6 % salt), while Group 3 includes “salt-resistant” species (growth up to >6 % salt). Except for M. bolettii, we observed that the size of colonies significantly decreased as salinity increased (Table 3). As for M. bolettii, the size of colonies increased from 1.16 ± 0.4 mm in the Middlebrook 7H10 control medium up to 2.95 ± 0.9 mm in 3 % NaCl Middlebrook 7H10 medium (P < 0.05, student’s t test), then decreased down to 0.4 ± 0.2 mm in 7 % NaCl Middlebrook 7H10 medium (P < 0.05, student’s t test) (Fig. 1; Table 4). Of the 15 analyzed Mycobacterium species in this study, we identified a total of 70,580 protein-coding sequences, varying from 3861 protein-coding sequences in “M. canettii” to 6241 in M. fortuitum (Table 1). The core-genome contains 37,132 protein sequences accounting for 52 % of the pan-genome. These 70,580 proteins were characterized into 6043 orthologous protein groups, including 1563 core-genome groups and 91 strain-specific groups. Furthermore, using orthoMCL clustering, no unique genes (gene shared only by the genome of species belonging to the same group) were found in Group 2 and Group 3. However, 290 genes were unique to species of the Group 1, with 58 % of these genes being annotated as hypothetical proteins while the other 42 % were Pro-Glu (PE) and Pro–Pro-Glu (PPE) family proteins (14.8 %), glycosyltransferase (4.5 %), type I restriction/modification system specificity determinant (4.1 %), oxidoreductase (4.1 %), membrane protein (4.1 %), isoprentenyl-diphosphate delta-isomerase (2.08 %), methyltransferase (2.08 %), serine/threonine-protein kinase transcriptional regulatory protein pknK (2.08 %), sn-glycerol-3-phosphate ABC transporter substrate-bonding Ipo protein Ugp B (2.08 %), hydrolase (2.08 %) (Table 5; Fig. 2). Studies reported that general stress tolerance proteins such the Glucose starvation inducible Protein B (GsiB) and a putative enoyl-CoA hydratase (EchM) , Na+/H+ efflux pumps proteins , porin and genes implicated in porin regulation  are involved in tolerance of toxic compound including salt. However only three proteins were found to harbor the GsiB domains with low identity <30 % and annotated as two extracellular solute-binding protein (M. fortuitum and M. avium) and one peptide ABC transporter substrate-binding protein (M. hominissuis). Also, from one to four Na+/H+ antiported and transporter proteins were found in M. abscessus, M. bolleti, M. massiliense, M. avium, M. intracellulare, M. fortuitum and M hominissuis. From one to three porin precursor and one aquaporin proteins were found in M. abscessus, M. bolleti, M. massiliense, M. fortuitum and M. massiliense. We observed a previously unrated wide range of salt tolerance for mycobacteria, from 1 % (M. lentiflavum) to 8 % (M. fortuitum) among mycobacteria of veterinary and medical interests comprising of obligate and opportunistic pathogens. Data here reported were authenticated by being reproduced in triplicate. Furthermore, data here obtained for M. abscessus and M. chelonae agree with the previously reported 50 g/L salt tolerance for the same species using a comparable methodology . Likewise, the 5 % limit here found for M. intracellulare, has been previously reported using a slightly different methodology . The data here reported for M. tuberculosis also agree with those previously reported for M. tuberculosis and Mycobacterium bovis using the BioLog technique . In a later study, M. tuberculosis H37Rv as well as a M. tuberculosis Beijing strain were shown to be highly susceptible to salt with metabolic activity exponentially dropping as salt concentration increased from 0 to 3 % . Accordingly, we observed that M. tuberculosis growth was inhibited by salinity rate >3 %. In this study, we observed that M. tuberculosis complex members tolerate up to 3 %, most M. avium complex members between 4 and 5 % and M. abscessus and M. bolettii up to 7 %. Furthermore, variations were observed within these phylogenetic complexes, as previously reported for M. tuberculosis and M. bovis in the M. tuberculosis complex . In the M. avium complex, M. chimaera exhibits a salt tolerance limited to 3 %, which is much lower than that of M. avium subsp. homnissuis which is limited to 7 %-NaCl. The same observation holds true for the M. chelonae-abscessus complex where M. chelonae exhibits a 3 % tolerance whereas M. massiliense grew up to 4 % and M. bolettii up to 7 %. It is worth noting that these two species yielded quite different colony morphology, which was smooth for M. bolettii and rough for M. abscessus. Such notable differences in salt-tolerance could be further incorporated in the easy identification of colonies in clinical microbiology, as previously reported . Rather than observing a correlation with the phylogenetic position, we observed a correlation with the genome content and encoding capacity. Indeed, we found that Group 1 salt-susceptible mycobacteria contained a 290-gene core that is absent in salt-tolerant groups. It is worth noting that more than one-third of these genes encode for PE/PPE family proteins. PE/PPEs are functionally associated with type VII or ESX secretion systems and could act as virulence factors helping the bacteria to establish a successful infection inside the host [20–22]. We therefore observed an inverse correlation between salt tolerance and host adaptation (Fig. 3). In particular, Group 1 contained only species associated with the infection of terrestrial mammal organisms such as M. tuberculosis, M. canettii, M. bovis, M. lentiflavum and M. chelonae; and the infection of marine mammal organisms, notably whales such as M. marinum (formally Mycobacterium balnei) . Even whales maintain low serum sodium concentration (152 mEq/L) similar to the salt concentration (135–145 mEg/L) measured in terrestrial mammals . General stress tolerance proteins , Na+/H+ efflux pumps , porins and genes implicated in porin regulation  are of utmost importance for bacteria in order to adapt to environmental changes such as the presence of toxic compounds including salt. Strangely, only three proteins harboring the GsiB domain and a putative enoyl-CoA hydratase (EchM) previously reported to be responsible for salt tolerance  were found with low identity <30 % in M. fortuitum, M. avium and M. hominissuis, which tolerate salt. Na+/H+ efflux pumps proteins and porins were found only in strains which are intermediate or resistant to salt. In conclusion, we propose that salinity is one of the multiple factors which determine the ecological niches of mycobacteria, with tolerance to salt being roughly inversely correlated with host adaptation. Performed the experiments: SA, MS, MP. SA, MS, MP and MD contributed to the conception, design, analysis, and interpretation of the data, drafting of the manuscript and revision of the content. All authors read and approved the final manuscript. All the data supporting the findings is contained within the manuscript. Except for “M. canettii”, all clinical strains have been isolated and cultured by the authors. No ethical approval was required for this study. The “Institut Fédératif de Recherche 48” (Marseille France) has stated that no Ethical approval was required for studies involving anonymous clinical isolates. This study was supported by URMITE, Marseille, France.